'I have time' should be the guiding word especially of dressage riders during the entire course of training. Most of us learn the truth of what Podhajsky says the hard way. We all like quick fixes, and it is easy to be tempted by training 'systems' that promise quick results for you and your horse - where’s the harm? Thinking about things we have learned quickly or slowly may help to clarify the problem. Several years ago, I was using a Stanley knife - it slipped and I cut myself quite badly. To this day, although I can brace myself and use a Stanley knife, I am very careful, and even the sight of one makes me feel just a little queasy. This is an example of 'one trial' learning. The consequences of what I did (being careless with the knife) were big, and I won’t make that mistake again. To take a very different example, the bolts on our feed room door can only be done up in one order - you have to fasten a hook in the middle of the door first, then do up the other bolts. I got this wrong for months (and so do most people, it’s not just me!). The consequences of my actions here were very small - I simply had to undo some bolts and start again, so I learned very slowly. In both cases, I learned what I needed to learn. In the first, it was quick, and with some serious side effects (fear of Stanley knives, which is a deep seated, physical reaction - hard to entirely fix). In the second case, I learned slowly, but with no side effects. Horses and people both learn much faster when the consequences, good or bad, of their behaviour are big. Otherwise, many repetitions of the task may be needed in order to learn it thoroughly. 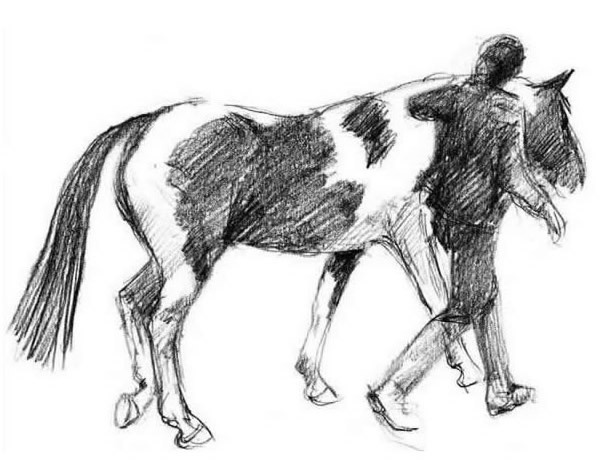 For the vast majority of horse training, we want to choose the latter method of training - lots of repetition, and small consequences for the horse’s behaviour. In rare cases, say where the horse’s behaviour is actually dangerous, we may have to do things a bit differently, but this should be the exception. So, beware of ‘systems’ or individual trainers who promise, and sometimes deliver, quick fixes when training horses. Seeing a horse’s behaviour changing rapidly may look impressive, but be sure you understand what has caused the change and that there are no ‘side effects’ - or you may end up with more problems than you started with!